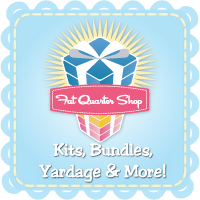 If you didn't know already, I plan to review one pattern a month and each will include a giveaway! Each review will have the same 8 criteria and will follow the same structure. Since everyone finds different parts of a pattern more or less important when it comes to deciding to use one. I chose this pattern because I had it on hand and had already put together a bunch of pears and apples. They were a LOT of fun and I thought, hey why not make all of the items in the pattern! I seriously LOVE the organization and layout of this pattern! The instructions are nicely laid out on one 22" x 17" piece of paper. There is a line to cut the paper in half so that the instructions are on one 11" x 17" half of paper and then the pattern pieces are on the other 11" x 17" half of the paper. Making it easy to reference when you are sewing and easy to store. The instructions are well written and clear. They were very easy to read and follow. I had no problem getting every one of the patterns to come out just like the pictures! The instructions are so clear and concise that any level of sewer could pick this pattern up and succeed with it. Definitely a beginner to experienced pattern. Each pincushion takes a different amount of time. Apple & Pear: Each one took me around 35 minutes total including cutting and embroidery. Strawberry: A bit longer than the apples and pears, probably closer to 45 minutes to an hour. The embroidery takes a bit longer, all those seeds and the flowers. However this was probably my FAVORITE one! It brought back my love of hand sewing and it was just a blast to sew. Tomato: This was by far the fastest of the four, taking maybe 20 minutes or so. There was no embroidery and the leaves were optional. But it was still fun and super cute! I would do this pattern again, and again, and again. I enjoyed cutting and putting together each "fruit" and have not only put a lot together already but would definitely make more! I have one of each fruit for myself. My mom wanted and received a pear and an apple. My little man claimed a pear and an apple of his own and keeps them in his bed with his other stuffed animals. I had tons of fun putting each of these fruits together. I cannot wait to try another pincushion pattern of Heather's! 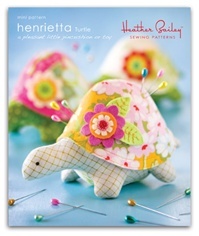 Like this little Henrietta turtle one! SOOOO CUTE!!!!! I found that because each pattern had several pieces, it was easier to trace the pattern pieces onto the fabric or felt and then cut. This was much faster than pinning each piece and cutting them individually. 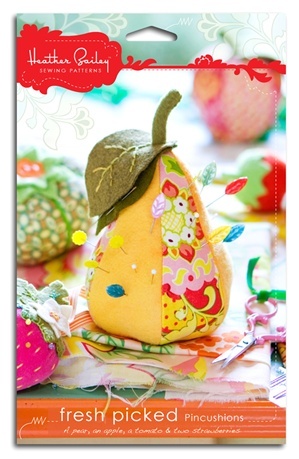 This month I have a pear & apple set, Winners Choice! 1. Leave a comment. Any comment. Maybe you would like to suggest other criteria? Or have a question about this pattern? 2. For a second chance to win, blog about this giveaway and then come back and leave a link to your blog. "I'm a new follower from the cafemom group :) looking forward to reading your other reviews!" Thank you EVERYONE for your comments and entries! Another review will be up in a week or so with another giveaway! loved the review! my mom and I are obsessed with pin cushions, so we should make these soon! Thank you! Thanks so much for an actual pattern REVIEW! That's so helpful, maybe especially so for beginners like me. I don't have any cute pincushions (I'm using a kitchen sponge) and have been wanting to make one or more - there are so many really cute ones - and this review is certainly helpful in that regard. I'm a new follower from the cafemom group :) looking forward to reading your other reviews! I made Heather's turtle and found her instructions easy to follow. Turned out great. Really like the pear. What a cute pattern, thanks for the chance to win! Cute pattern, all these pincushions are so much cuter than my current one! What do you use to stuff them? Thanks for the chance to enter! Adorable! These are precious and thanks for the giveaway and your comments on the pattern. So many possibilities with all the fabulous fabrics out there. I LOVE LOVE LOVE these pincushions! Can't wait to get my hands on one of these patterns! Great review! I have seen pincushions popping up all over but was too scared to try making one. You have encouraged me that I can do it with a good pattern! Thank you for the review! I just love these pin cushions. So cute! I could use new pin cushions! I have ordered this pin cushion and reading you review and seeing your beautiful handiwork is making me desperate to have it NOW...*takes deep breath* but I am working on my patience!